Sometimes I come upon a camera for cheap and just can’t resist buying it, even if it’s not on my want list. 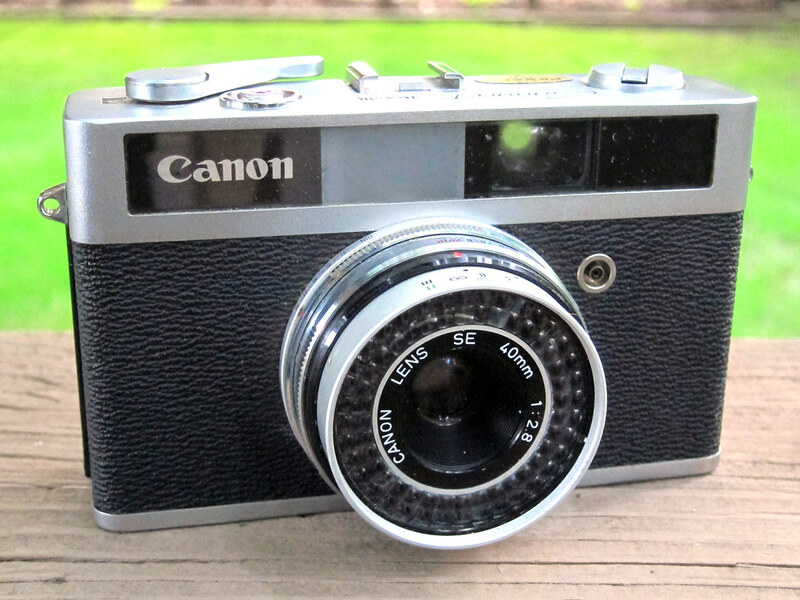 So it went with this 1963 Canon Canonet Junior. Really, I’ll buy any Canonet I don’t already have if the price is right. Canon made 13 Canonet models from 1961 to 1982 and they all feature good lenses. You can hardly go wrong with a Canonet – well, except that most of them have gummy light seals that need to be replaced. All Canonets feature a coupled light meter. Junior’s meter is of selenium (it’s behind that bumpy plastic ring around the lens), so it needs no battery. 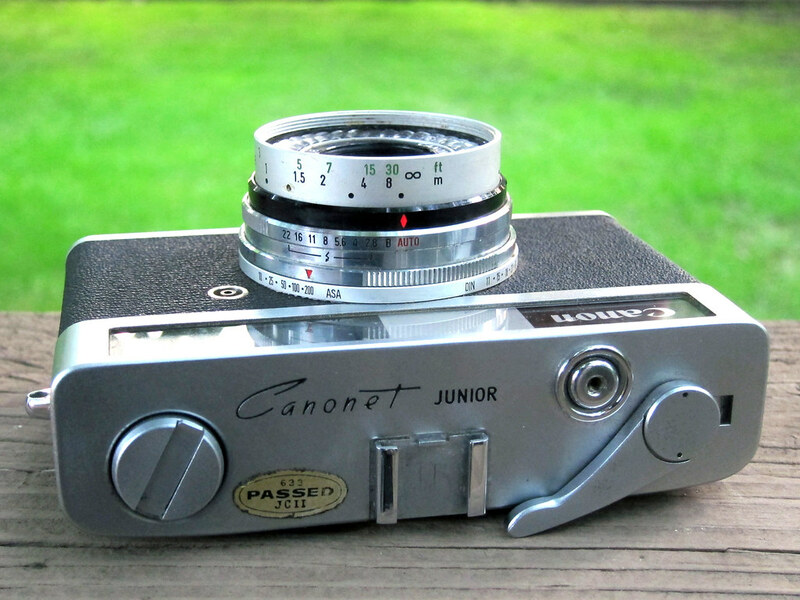 Most Canonets also include a coupled rangefinder and shutter-priority autoexposure, but not the Canonet Junior, which offers guess focusing and full autoexposure. You can set aperture manually if you want, but it’s really meant only to be done when a flash is attached, as the shutter fires only at 1/30 sec. then. Junior isn’t junior sized, but to be fair it’s marginally smaller and lighter than the original 1961 Canonet. It features a 40mm f/2.8 lens, of four elements in three groups. There are better lenses in the Canonet line, but this one is good enough. Junior’s leaf shutter fires from 1/30 to 1/250 sec. You can dial in film speeds up to only 200 ASA, limiting Junior’s usefulness in low light. The Canonet Junior was sold as the Bell and Howell/Canon Canonet 28 in the US. If you’re a Canonet fan, you might also enjoy my reviews of the Canonet QL 17 G-III (here) and Canonet 28 (here). Other rangefinder cameras I’ve reviewed include the Yashica MG-1 (here), the Konica Auto S2 (here), and the Minolta Hi-Matic 7 (here). Check out all of my camera reviews here. I opened my Junior to find an expired and partially spent roll of Kodak Gold 200 film inside. Naturally, that fogged several frames. 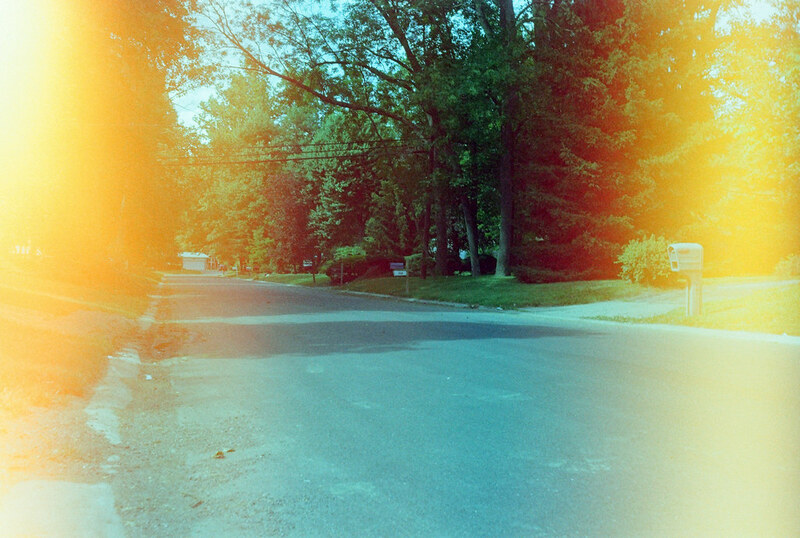 I quickly shot the rest of the roll, which amounted to maybe eight exposures, and sent it off to Dwayne’s for processing. 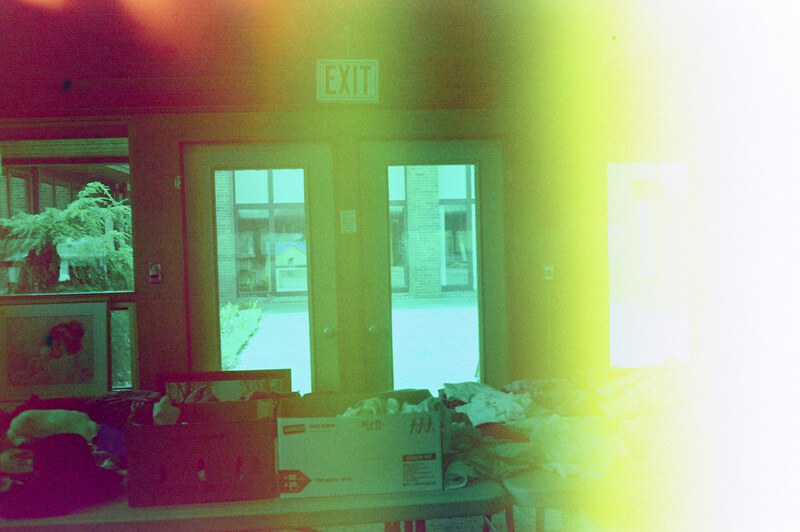 The thrill of found film is not knowing what you’ll get back from the processor. Last time I got a family’s late-1960s vacation to Niagara Falls. This time the subjects were far less interesting. Several shots involved this downed tree. 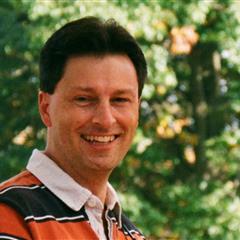 This shot shows that the lens yields sharp and contrasty results. 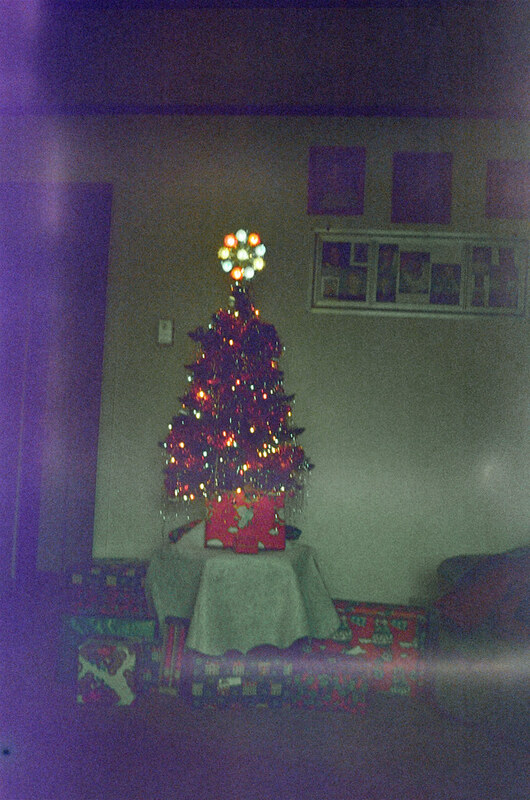 Kodak Gold film has been made for long enough that this Christmas tree could be from the 1990s. I blew through the rest of the roll in 20 minutes in my yard. Junior was easy enough to use: set the aperture ring to Auto and twist the focus ring until the needle inside the viewfinder points to the right setting: portrait, group, or landscape. But watch the shutter-speed needle inside the viewfinder; if it’s in the red, there’s too much or too little light for the shot. My Junior’s viewfinder is foggy but usable. The shutter button is stuck down but a little pressure on it fires the shutter anyway. If I were to use this camera regularly, I’d fix these problems. But I’m not, so I won’t. This is the best of my photos. 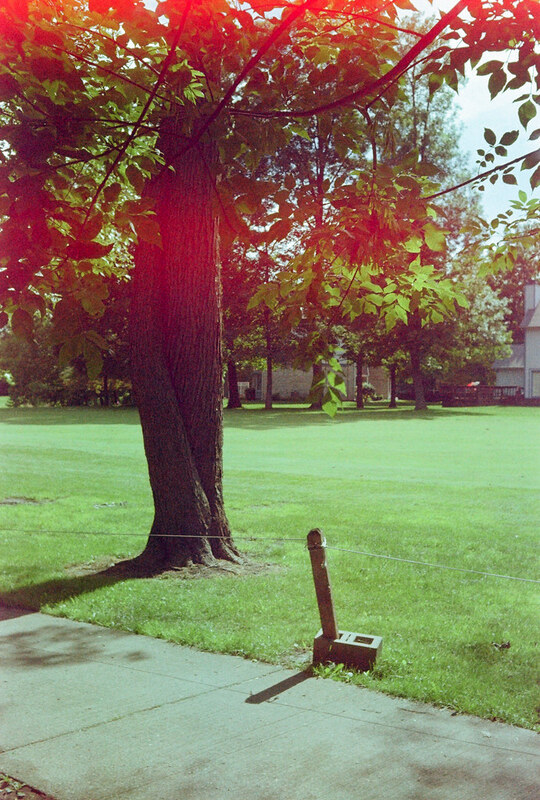 This frame was inside the film canister when I opened the camera, so it wasn’t fogged. Those red streaks suggest a wicked light leak. This is my street, from the end of my driveway. 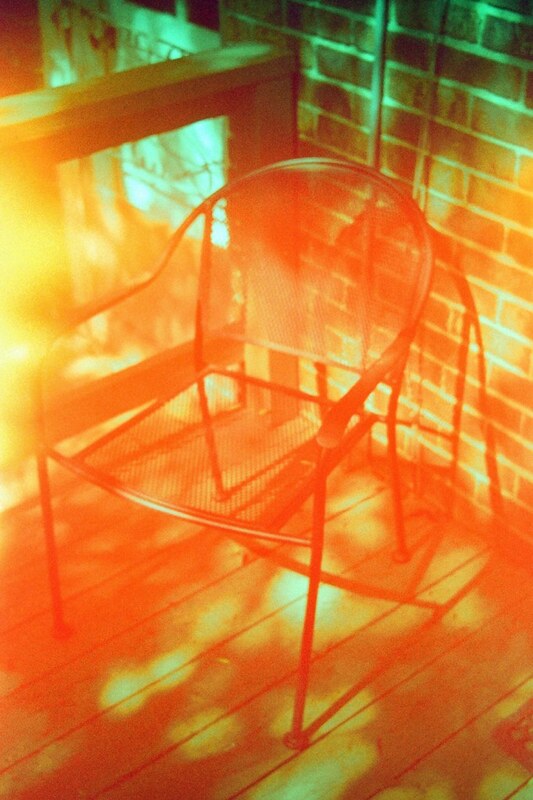 This shot of a chair on my deck is my favorite because of the wacky colors. No amount of Photoshopping could save that chair from the orange. 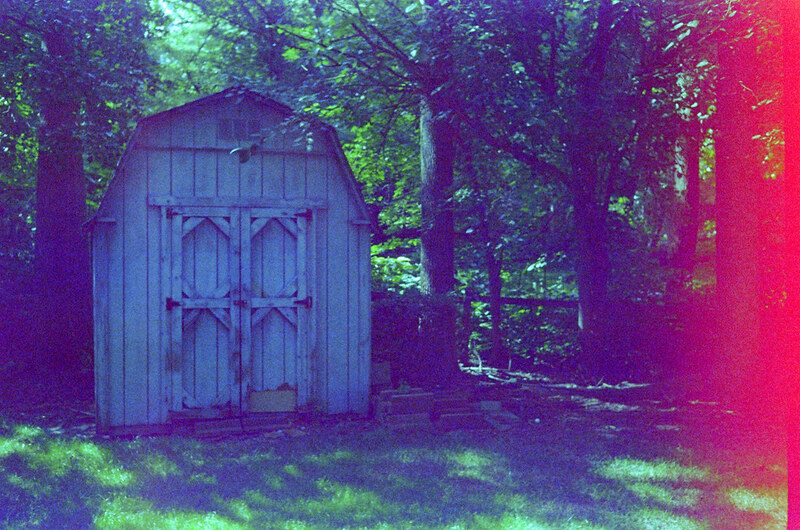 But I was able to remove a strong purple caste from this image of my shed. You can see all of the photos that turned out (and I use that phrase loosely) in my Canon Canonet Junior gallery. 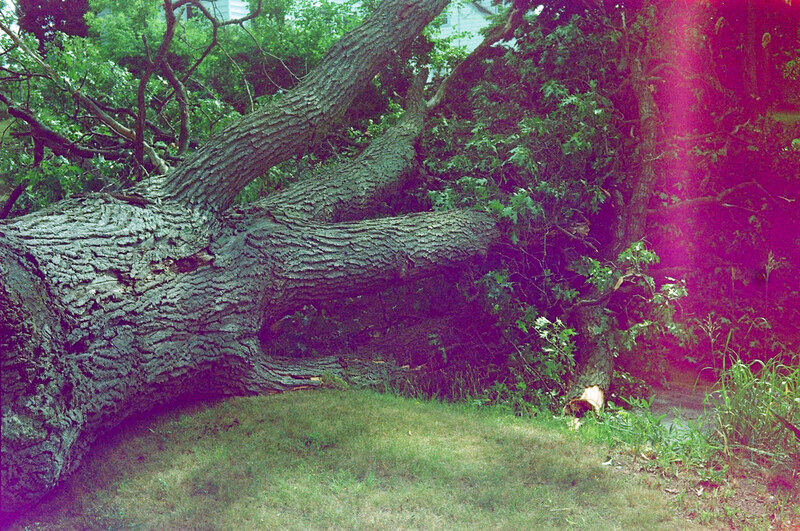 I’m not usually an expired-film kind of guy, but this was fun. I doubt I’ll shoot this camera again, though. I have many better choices in my collection for an easy afternoon’s shooting, and those cameras don’t need repairs.